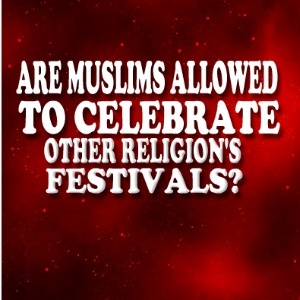 You Read Creation: ARE MUSLIMS ALLOWED TO CELEBRATE OTHER RELIGION'S FESTIVALS? ARE MUSLIMS ALLOWED TO CELEBRATE OTHER RELIGION'S FESTIVALS? Firstly: because this entails imitating or resembling them, and “Whoever imitates a people is one of them.” (Narrated by Abu Dawood). This is a serious warning. ‘Abd-Allaah ibn al-‘Aas said: Whoever lives in the land of the mushrikeen and celebrates their Nawrooz (New Year) and their Mahrajaan (festivals), and imitates them until he dies, he will be a loser on the Day of Resurrection. Thirdly: festivals are the matter of religion and beliefs, not the matter of worldly customs, as is indicated by the hadeeth: “Every nation has its Eid, and this is our Eid.” Their Eid or festival reflects their corrupt beliefs of Kufr and Shirk. Fourthly: “And those who do not witness falsehood, and if they pass by some evil play or evil talk, they pass it by with dignity” [al-Furqaan 25:72 – interpretation of the meaning]. The scholars interpreted this aayah was referring to the festivals of the mushrikeen. It is not permissible to give any of them cards for their festivals, or to sell them cards or any of the other things they need for their festivals such as lights, trees or food – including turkey, candy canes, etc. If these celebrations are the festivals of the kuffaar and mushrikeen, it is not permissible to take part in those innovated festivals, because doing so implies helping them to commit sin and transgression. Taking part in their festivals also involves imitating the kuffaar, which is forbidden in Islam. (Reported by Abu Dawood and Ahmad). Can a muslim celebrate a non muslim holiday like Thanksgiving? "Whoever seeks a religion other than Islaam, it will never be accepted of him, and in the Hereafter he will be one of the losers." Ibn al-Qayyim (may Allaah have mercy on him) said: it is not permissible for the Muslims to attend the festivals of the mushrikeen, according to the consensus of the scholars whose words carry weight. The fuqaha’ who follow the four schools of thought have stated this clearly in their books… Al-Bayhaqi narrated with a saheeh isnaad from ‘Umar ibn al-Khattaab that he said: “Do not enter upon the mushrikeen in their churches on the day of their festival, for divine wrath is descending upon them.” And ‘Umar also said: “Avoid the enemies of Allaah on their festivals.” Al-Bayhaqi narrated with a jayyid isnaad from ‘Abd-Allaah ibn ‘Amr that he said: “Whoever settles in the land of the non-Arabs and celebrates their new year and festival and imitates them until he dies in that state, will be gathered with them on the Day of Resurrection.” (Ahkaam Ahl al-Dhimmah, 1/723-724).